[ CONTEST ALERT! ] Let's Play The Nestle Yogurt + Jelly Word Game! Have your heard of the term Portmanteau? It's when you mix two words to form a new, creative-sounding one. Popular portmanteaus include mixing the word spoon + fork to create spork! A work of genius that has been helping me enjoy my lunch at work. Other forms would be mixing names of popular celebrities such as Brad (Pitt) and Angelina (Jolie) to form Brangelina! Let's play a little Portmanteau game on the newest product of the Nestle Fruit Selection Yogurt! This time, this little sweet and healthy treat comes with jiggly jelly that makes your snack time more enjoyable! Three lucky winners will get 15 Nestle Fruit Selection Yogurt with Jelly cups EACH! My afternoon is complete with Nestle Fruit Selection Yogurt because it's ______________. That's ________ + __________ = _________! 2) Include your Name and Email Address to make it easier for us to contact you if your entry has been chosen. 3) You may send in one entry per day. 5) This contest will run from September 6 (that's today) until September 10 (Friday). 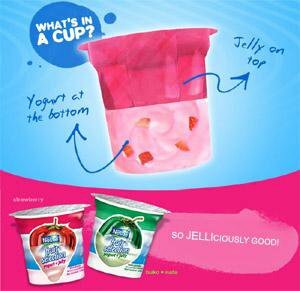 6) Winners will have to pick up their Nestle Fruit Selection Yogurt with Jelly cups in Taguig City. My afternoon is complete with Nestle Fruit Selection Yogurt because it's JELLYCIOUS. That's JELLY + DELICIOUS = JELLYCIOUS! My afternoon is complete with Nestle Fruit Selection Yogurt because it's DELECTIVINE. That's DELECTABLE + DIVINE. My afternoon is complete with Nestle Fruit Selection Yogurt because it's AFFORTABULOUS. That's AFFORDABLE + FABULOUS = AFFORTABULOUS! My afternoon is complete with Nestle Fruit Selection Yogurt because it's UBER + LUSCIOUS = UBERLUSCIOUS! My afternoon is complete with Nestle Fruit Selection Yogurt because it's Heavenificent. That's Heavenly + Magnificent = Heavenificent! My afternoon is complete with Nestle Fruit Selection Yogurt because it's Wondercent. That's Wonderful + Magnificent = Wondercent! My afternoon is complete with Nestle Fruit Selection Yogurt because it's APPETIZING + DELECTABLE = APPELECTABLE! My afternoon is complete with Nestle Fruit Selection Yogurt because it's DELICIOUFIED. That's DELICIOUS + ELECTRIFIED = DELICIOUFIED! My afternoon is complete with Nestle Fruit Selection Yogurt because it's MAJORLICIOUS. That's major-major + delicious = MAJORLICIOUS! My afternoon is complete with Nestle Fruit Selection Yogurt because it's EXCIZING. That's exciting + amazing = EXCIZING! My afternoon is complete with Nestle Fruit Selection Yogurt because it's INCREVELOUS. That's incredible + marvelous = INCREVELOUS! My afternoon is complete with Nestle Fruit Selection Yogurt because it's AFFORDABULOUS. That's AFFORDABLE + FABULOUS = AFFORDABULOUS! My afternoon is complete with Nestle Fruit Selection Yogurt because it's TASTASTIC. That's TASTY + FANTASTIC = TASTASTIC! My afternoon is complete with Nestle Fruit Selection Yogurt because it's NUTRILICIOUS. That's NUTRITIOUS + DELICIOUS = NUTRILICIOUS! My afternoon is complete with Nestle Fruit Selection Yogurt because it's Yellicious! That's yogurt + delicious = Yellicious! My afternoon is complete with Nestle Fruit Selection Yogurt because it's Yolly! That's yogurt + jelly = Yolly! My afternoon is complete with Nestle Fruit Selection Yogurt because it's Yummylicious! That's yummy + delicious = Yummylicious! My afternoon is complete with Nestle Fruit Selection Yogurt because it's Healtilible!. That's Healthy + Incredible = Healtilible! My afternoon is complete with Nestle Fruit Selection Yogurt because it's Creamilicious! That's Creamy + Delicious = Creamilicious! My afternoon is complete with Nestle Fruit Selection Yogurt because it's Yowesome! That's Yogurt + Awesome = Yowesome! My afternoon is complete with Nestle Fruit Selection Yogurt because it's Gurtelly! That's Yogurt + Jelly = Gurtelly! My afternoon is complete with Nestle Fruit Selection Yogurt because it's PERRIFIC! That's perfect + terrific = perrific! My afternoon is complete with Nestle Fruit Selection Yogurt because it's FRESHILIRATING! That's fresh + exhilirating = FRESHILIRATING! My afternoon is complete with Nestle Fruit Selection Yogurt because it's SWEESATIONAL. That's SWEET + SENSATIONAL = SWEESATIONAL! My afternoon is complete with Nestle Fruit Selection Yogurt because it's FRUITILICIOUS. That's FRUITY + DELICIOUS = FRUITILICIOUS! My afternoon is complete with Nestle Fruit Selection Yogurt because it's Superelly! That's Super + Jelly = Superelly! My afternoon is complete with Nestle Fruit Selection Yogurt because it's FANTABULOUS. That's FANTASTIC + FABULOUS = FANTABULOUS! My afternoon is complete with Nestle Fruit Selection Yogurt because it's MAJORRIFIC! That's major + terrific = MAJORRIFIC! My afternoon is complete with Nestle Fruit Selection Yogurt because it's SOFANTASTIC! That's soft + fantastic = SOFANTASTIC! My afternoon is complete with Nestle Fruit Selection Yogurt because it's SATIATERRIFIC. That's SATIATE + TERRIFIC = SATIATERRIFIC! My afternoon is complete with Nestle Fruit Selection Yogurt because it's Electrivelous! That's electrifying + marvelous = Electrivelous! My afternoon is complete with Nestle Fruit Selection Yogurt because it's FRESHIOUS! That's fresh + delicious = FRESHIOUS! My afternoon is complete with Nestle Fruit Selection Yogurt because it's YOGICAL! That's yogurt + magical = YOGICAL! My afternoon is complete with Nestle Fruit Selection Yogurt because it's YOGULICIOUS! That's YOGURT + DELICIOUS = YOGULICIOUS! My afternoon is complete with Nestle Fruit Selection Yogurt because it's HELLY! That's HEALTHY + JELLY = HELLY! My afternoon is complete with Nestle Fruit Selection Yogurt because it's temptilicious! That's Tempting + Nutricious = Temptilicious!